32 year old man suffered paralysis when he sustained an injury stemming from the use of a harness that malfunctioned. Suit filed against company that produced harness. 28 year old man was injured by conveyor belt while at his job. A third party product liability suit filed against manufacturer of conveyor because system had an exposed pinch point. Worker suffered severe leg injury requiring multiple surgeries. 42 year-old woman presented to her primary care health clinic with unstable angina over a six-week period. During this time, the clinic saw the patient 4 times, and each time sent her home. Eventually, the patient was ordered to have a cardiac catheterization on an emergent basis and died during the procedure. 24 year-old laborer was asked to help a crane operator at a warehouse to load material on to a truck. While the crane operator was steering the crane, the top of the crane made contact with overhead power lines, thereby causing worker to sustain electrical induced injuries; Plaintiff suffered severe scarring and third-degree burns, partial amputation of foot, partial amputation of two fingers, multiple surgeries on right hand. 55 year old worker sustained an injury to toe. Went to clinic and was mis-diagnosed with simple injury to foot when in fact he had an infection that went untreated. Plaintiff had a partial amputation of leg. Malpractice claim made against physician for negligent diagnosis. 51 year old pedestrian while riding a bike was struck by car and suffered fractured leg, facial bruising, memory loss. 51 year old worker at a plastic molding company injured hand on molding machine. Suffered compartment syndrome. 25 year old day worker suffered injury when working at a job site. Part of structure collapsed on worker who suffered multiple injuries that required hospitalization. 65 year-old woman presented to the emergency room with slurred speech and weakness and was discharged home. The following day the patient suffered a stroke and had a prolonged convalescence period thereafter. Two companies needed financing for development project and entered into a contract with financial firm to secure financing for the deal. Pursuant to the contracts, the companies provided $500,000.00 to obtain the services of the financial firm. Financial firm was supposed to secure financing from several entities totaling over $50,000,000.00. Financial firm never attempted to secure financing. A breach of contract claim was brought seeking potential lost profits that would have been earned if the project was developed. 35 year old worker sustained an injury to arm. Went to physician and was mis-diagnosed with sprain. Patient needed immediate surgery. Plaintiff suffered partial loss of use of his arm. Malpractice claim made against physician for negligent diagnosis. 29 year old factory worker suffers an amputation of his arm due to a defective conveyor belt that did not have any guards. 20 year old worker at printing press got his hand caught between roller and suffered traumatic amputation of 2 fingers. Product liability suit filed against the manufacturer of the printing press. 16 year old was involved in a head one collision with another car while a passenger. The car the client was in negligently crossed over a median and struck an oncoming vehicle. Plaintiff sustained serious injuries which resulted in paraplegia. A claim alleging defective seatbelt and rear seat construction was pursued. 77 year-old man with pulmonary embolism dies as a result of physician’s misdiagnosis. 51 year-old woman undergoes unnecessary hysterectomy during which a bowel perforation resulted. The patient required extended hospitalization. 61 year-old man had health insurance policy and presented a $6,000.00 claim for home health care. Carrier denied coverage thereby disrupting the patient’s care and treatment. Lawsuit was filed for breach of contract and claim that denial of benefits contributed to the deterioration of the patient’s health. 7 year-old boy presented to neighborhood clinic with groin pain. Clinic failed to diagnose testicular torsion. Eventually boy had to have left testicle surgically removed due to infection. Pregnant woman was struck by a hit and run driver in a residential area. Examination of the scene revealed that the stop sign which the driver ran, was partially obscured by a tree belonging to a homeowner. Mother had to deliver baby prematurely by C-section; baby suffered some developmental problems due to the premature birth. Claims made against homeowner and municipality for not taking proper care of over-grown vegetation. Subsequent claim made against auto manufacturer for a defective seatbelt. 23 year-old woman underwent C-section and sustained a perforated viscus which was undetected. She eventually developed an intra-abdominal infection which required additional surgery to treat. 42 year-old woman underwent a hysterectomy, and during the surgery a ureter was cut and not detected. Patient required two additional surgeries to repair the ureter. 80 year-old man underwent cancer screening exam which failed to detect the presence of cancer which had not yet spread. Eventually patient underwent diagnostic cancer exam which revealed the presence of cancer. Patient sued the facility for the negligent performance of the initial cancer screening exam. 71 year-old lady crossing the street was struck by an oncoming vehicle that failed to yield the right-of-way. Plaintiff sustained a fractured hip. 92 year old woman exits an elevator in a hotel lobby. The elevator does not line up with the floor thereby created a tripping hazard. Guest trips over the uneven landing and fractures hip. 19 year-old was mugged at a residential development due to negligent security; a lawsuit was filed against the development for not having adequate cameras and guards on the premises. Plaintiff fractured right hand and sustained facial injuries. 46 year-old man took his children to a bowling alley and slipped and fell on oil residue that was tracked from the bowling lane on to the approach area. Plaintiff suffered a fractured elbow. 40 year-old man presents to the emergency room with back pain. Was told by the ER staff that he had passed a small kidney stone, but a second stone was not detected. The patient was discharged, and subsequently suffering an infection. The patient was having pain for 34 days before the second kidney stone was diagnosed. 50 year old woman goes to dental clinic with toothache. Dentist negligently extracts several teeth that did not have to extracted. Patient suffered gum injury which required surgery by oral surgeon, and suffered loss of several teeth. 79 year old man went to health clinic for check up. Patient was referred to have a colonoscopy which was performed and was positive for polyps; Clinic received recommendation to repeat the colonoscopy in a year, but the patient was never advised by the clinic. Patient eventually developed colon cancer and died. 61 year old patient was recovering from surgery and suffered cardiac arrest. Physician did not timely re-intubate the patent who died several days later. 26 year old construction worker fell at job site when scaffolding collapsed. Scaffolding improperly assembled. Worker suffered shoulder injury, but was able to go back to work. 32 year-old man injures himself playing soccer at a community center when he trips on an underground pipe lacerating his knee. 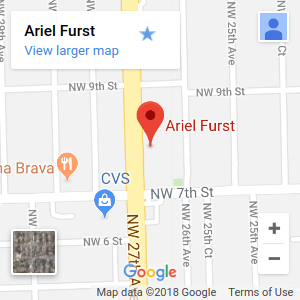 Ariel E. Furst is a trial attorney who has fought for the rights of personal injury victims throughout Florida since 1992. Our practice is focused on personal injury, medical malpractice, wrongful death, products liability, and other cases that involve someone getting hurt or injured. Ariel E. Furst doesn’t shy away from difficult cases. If at all possible, attempts are made to settle a case without the need to file a lawsuit. However, if a settlement cannot be obtained, a lawsuit is filed and if need be, a trial in front of a jury is pursued. The hallmarks of our practice are availability, personal attention, and persistence. The Law Office of Ariel E. Furst provides a free initial consultation to all clients. Contact our office online or call us at 305-643-3100 Ext. 206 to set up an appointment. Furthermore, we do not charge attorney fees unless we are able to recover compensation for you. Medical malpractice. We represent individuals who have suffered injury because of medical negligence, whether caused by a doctor, nurse, or other healthcare workers. We handle claims involving misdiagnosis or failure to diagnose, surgical error, failure to provide adequate or timely treatment, birth injury and technical error. Products Liability. We protect the rights of people who have been injured in accidents involving dangerous or defective products, from household goods to automobiles to industrial machinery or equipment. We will help you identify potentially responsible parties, including designers, manufacturers, and distributors. Other Personal Injury. Personal Injury covers a broad area. People can be injured by the negligence of others under various circumstances like car accidents, slip and falls, negligent security, malpractice, work related accidents, and even the wrongful denial of reimbursement under an insurance claim.